German impressionist. He was the son of a goldsmith from Zagreb. From 1865 to 1869 he studied at the Academy of Art in Berlin. He travelled in Europe and moved to Paris in 1882. There he exhibited at the Salon in 1883. In 1892 in Berlin, together with Liebermann and Leistikow, he founded the Gruppe XI that resisted academic tradition. In 1898 he was a co-founder of the Berlin Secession and he exhibited at the World Exhibitions of 1899, 1900 and 1901. In 1904 he became a member of the Senate of the Royal Academy of Arts. In 1905 he won the gold medal at the Großen Berliner Kunstausstellung. He died in 1910 at his home in Berlin. 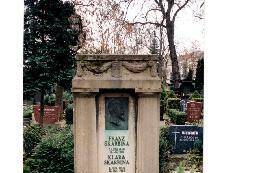 The grave of Franz Skarbina at the Alter Friedhof der St.- Jakobi-Kirchengemeinde, Neukölln, Berlin.